With the news that Sony is looking to launch Morbius the Living Vampire as their next Spider-Man spinoff (they already have VENOM filming and a Silver Sable/Black Cat movie that maybe a buddy flick or a fight movie or I have no idea), I figured I’d be a good guy and help them out. Here are 10 more they might consider launching next, presented in no particular order. 1.) Solo- While he lives, terror dies! What possible Spider-Man adjacent character could be more relevant in these terrorism obsessed times? You could play it incredibly straight and make him a kind of teleporting Jack Bauer, close to his classic comic book depiction and have him facing off against the colorful landmark obsessed anarchist group ULTIMATUM, or something more like his recent depiction a serio-comic-tragic depiction that shows him as a pawn of others who play upon his shattered psyche and unhealthy obsessions to use him as a kind of blunt instrument against their enemies. 2.) Prowler- A one-time criminal turned hero by the inspiration of Spider-Man, Hobie Brown dons a purple and green costume and uses homemade gadget to fight crime. Offering a different perspective than most of the spinoffs—Brown is African American and the spinoffs, including most of my own suggestions here, are lily white—and truly self-made hero. I also like the idea of a man inspired by a teenager to do right, a sort of flip of the usual mentor-mentee relationship. 3.) Annex- A veteran who lost a leg in combat but is given a sort of full body prosthetic/exoskeleton that could regrow limbs, temporarily from the goop contained within and conjure an assortment of weapons in a similar manner. Annex is angry and confused, which is a place a lot of veterans find themselves in these days of endless war but not war in which their service is glorified but they often find themselves without the kinds of support they actually need. Super hero movies can be anything; why not go political? 4.) Superior Foes of Spider-Man- Just adapt the book. Low-level Spidey villains—the Superior tag is ironic—who generally get caught as much from their own failures as they do from a hero’s intervention. Incompetence, betrayal, hilariously small-time stakes pursued with incredibly intricate heists…it would be a bright, silly delight with unexpected emotional punches. 5.) Cardiac- An anti-hero who is raging against the state of health care in the United States after his brother dies due to a combination of lack of funds and a pharmaceutical company that will not make its life saving drug available until they secure a price point they like—could there be a more NOW theme? Again, super hero movies can be anything, why not inject a little real world politics into it and then blow it up to operatic extremes? 6.) Screwball- A click obsessed sort of super villain who uses social media to boost her profile and is less interested in what crime she is doing then in doing it in the kind of style that will make her clips go viral. I’m imagining a plot that pulls into her into a dangerous situation where the never worried Screwball is forced to take things seriously to save people she cares about from harm. 7.) 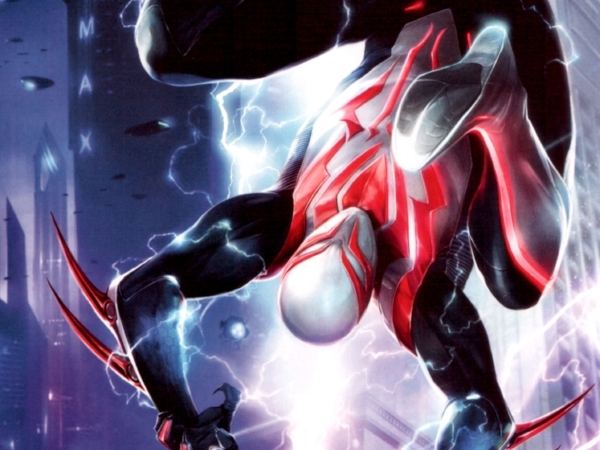 Spider-Man 2099- The look and feel of Blade Runner meets the box office of Spider-Man. How could it miss?! 8.) Silk- Also bit by a radioactive spider from the same experiment that created the spider that bit Peter Parker. Unlike with Peter, however, Cindy Moon was locked away to grow up, learn, and practice her “gifts” in a bunker with no access to anyone except her nuclear family—who eventually disappear without explanation—and her teachers. Finally freed, completely out of touch with the modern world and looking to find her parents, Moon must adapt, find a true life for herself, and expose the conspiracy that kept her hid and stole her family. 10.) Puma- Though raised on the reservation, Thomas Fireheart generally embraced the pleasures the “white world” offered over the ways of his people. Despite being supposedly chosen by destiny to be the hero of his people, he instead chooses to focus on the development of Fireheart Enterprises where he proves to be an excellent businessman. Nonetheless, when the tribe comes to him and reveals that seem to have been targeted by someone or something seeking to destroy them, he must balance the life he leads and the life those he loves believe he was meant to lead to save his tribe without losing himself.